We still don’t have an official launch date for the mid-engine Corvette C8, yet the internet has already started fantasizing about what the coupe will look like without the targa top. The talented Chazcron from MidEngineCorvetteForum has produced another rendering that will surely set Corvette enthusiasts’ hearts on fire. 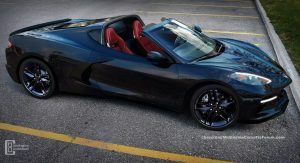 Brought to our attention by CorvetteBlogger, the rendering shows the coupe without the targa top and rocking red leather seats with white stitching. The rendering looks very realistic, even though it’s largely speculative. 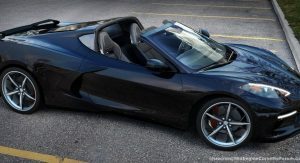 Still, the Corvette C8 spy shots we’ve seen so far have revealed roof-lines for the targa top which means the mid-engine Corvette will allow the driver and passenger the pleasure of open-top driving. The removable targa top is not something new for the Corvette as America’s sports car has had one-piece removable roof panels since 1984. Before that, all 1968-1982 Corvettes were made with removable targa tops. There’s no reason to believe the all-new 2020 Corvette won’t stick to the tradition. Since Chevrolet found a way to stow the tops inside the car in the later models, we tend to believe the same thing will go with the C8 Corvette. The question is where will it go. 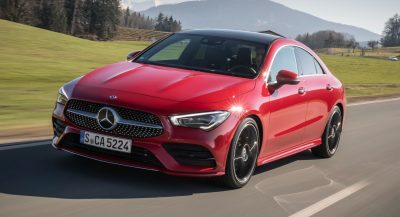 There are only three possible areas that could stow it: the front trunk, the space behind the seats or the storage area between the engine and the rear fascia. Still, storing the roof panel vertically behind the seats looks like the most convenient of the three options. Regardless of where it will be stowed, one thing is certain: the mid-engine Corvette will be a looker with or without the top. 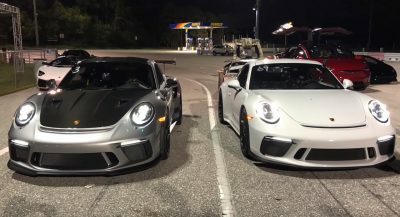 Over an R8, AMG GT, NSX, etc? The only appeal of this to me is the possible lower starting price and my love of V8’s. Fingers crossed it comes out looking much, much better than the renders. Not over an R8 or AMG Gt.. but definitely over an NSX.. if it starts at the Rumored price of $70k then it’ll have very little competition. And if hypothetically the $100k+ version has the 1000 hp displacement people are speculating then it’ll be hard not to pick this over an R8 or AMG GT— though their designs are truly original and beautiful . Again we are all shooting darts blindfold here.. If it looks like this I will buy one on day one. This thing looks sinister. I honestly think it’ll definitely look like this. Could someone hand me that tub of lube over there? Daddy is gettin excited! A …A T-.. (*gulp)… t..tub? Looks nice tbh, but the angle of the camera/render makes the nose looks so high. Well that’s because this is not what it’s going to look like. 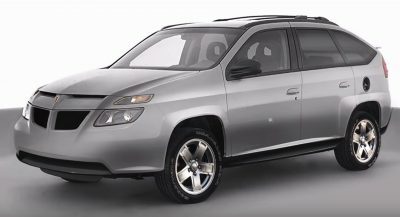 They keep posting different variations of the SAME render that takes more inspiration from the outgoing model then to what has actually been spied on the road. So you’re telling me the C8 will look nothing like this??? Thank goodness. I made a tracing (not a render) of the actual vehicle itself. Then colored and shaded it, and did as much research as I could regarding the C8 Zora and created a pretty accurate rendition of the vehicle. They have been using the same render for over a year now, and that render is based on what the vehicle looked like before the cladding ever came off. I made an entire other post detailing the history of the vehicle, Zora himself, and basically how this vehicle is a dedication to him and his dream. Nice work. Def looks a bit better but still too many design flaws in my terribly unhumble opinion. The headlights sit too high up on the body, should be lower and more towards the front. The rear is too boxy and the spoiler is a downright design disaster. The wheels are such a missed opportunity (hopefully also just prototype) and the front bumper is way too busy and incongruent. I still see, no matter how much I squint my eyes, very mediocre design work here. When you have the chance to do something like a mid-engine car, which is illogical and nothing more than a gift to your execs, engineers, and fans, you have an obligation to make it stunningly beautiful. This is not that. I like your render best! Lol funny thing, the C7 is based on the design of the C8. The Around 2004-2008 C8 was designed prior to the C7 but the decided the timing for a mid-engine vette was not right, so they instead released the C7 first. 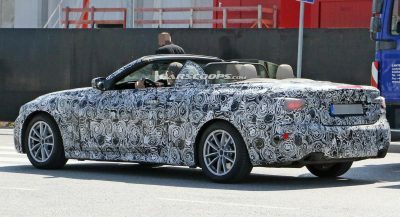 I’m guessing the top will stow flat in the rear hatch area, above the engine, just behind the seats. Doesnt look bad. Doesnt look amazing. Meet the C8 mid-engine “meh” edition. The “meh” of mid-engine supercars, only beaten in the not so great mid-engine coupe design segment by alien fish-faced McLaren’s. This is pretty much spot on. GM doing this to the Corvette is like Porsche deciding they should be creative with the 911’s shape/lines. Every Corvette since the C4 has had a signature look to it, and now….all that is gone, replaced by what looks like a cheap knock off of Ferrari, McLaren, etc. looks good. I hope the real deal does as much. haha yeah. I hate it when my car looks like a ferrari. I hate it when my car looks like a cheap knock off Ferrari.